A ROUND OF CARDS? 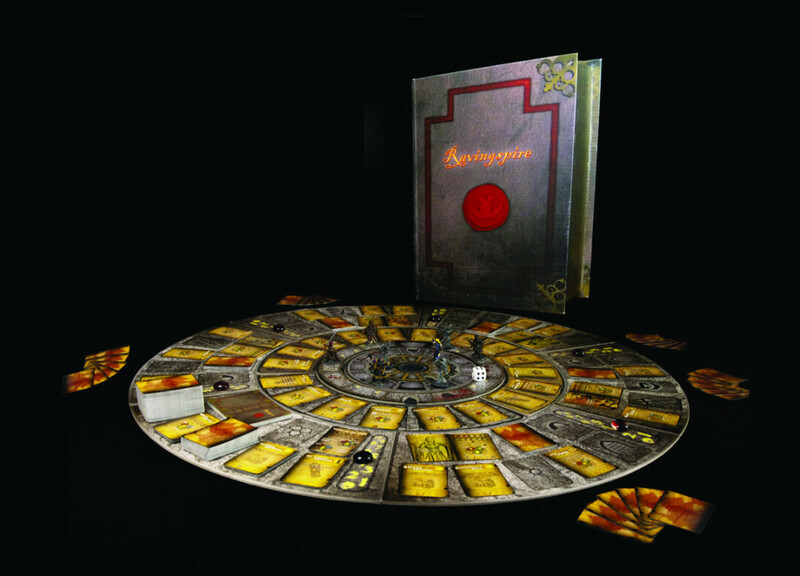 Ravingspire, a deck-building board game raised a whopping $75,000 on Kickstarter. The game is called Ravingspire: Assault on the Tower of Madness. The stats: A deck-building, rotating-dungeon board game of swords, sorcery and madness. For 1-6 players. 1,153 backers pledged $74,858 via Kickstarter. The original goal was $7,500. The characters: Cullen Bright, graphic designer; Cory Scanlan, writer; Joshua Carlson, writer, photographer, marketer. The story: The tower full of madness, which stands at the nexus of space and time, beckons, and only the passionate adventurer may enter and fight their way to the top, gaining loot and power while sanity seeps from them like water from a cracked pot. One year ago, three adventurers challenged madness and entered the game-making arena. They are known as Cory Scanlan, Joshua Carlson, and Cullen Bright (a Chippewa Falls resident). The three are the passionate creators of Ravingspire: Assault on the Tower of Madness, which is set to throw open its ominous doors for all passionate gamers this coming October, thanks to a massively successful Kickstarter campaign. The trio may be the up-and-coming triumvirate of the independent gaming movement. Ravingspire is a product of passion, each triumvir having spent an equal share of sweat, effort, and sanity on the project. The sacrifice shows in the response that the game received via Kickstarter, a crowdfunding website where only 43 percent of campaigns reach their lowest goal. In order to throw open the massive reinforced wooden doors of Ravingspire, the goal was to raise $7,500. When the final moment of the campaign came to pass, Ravingspire had garnered a massive $74,858 and unlocked all of its original stretch goals as well as secret rooms that no one knew existed, except the gamemakers themselves. Scanlan, if drawn, provides a +8 for nerd-dom knowledge and a +10 for gaming mechanics. His skillset was built through running a “nerd-dom” blog and podcast titled “Vorpal Chainsword.” Scanlan is the mastermind of the gaming mechanics and has spilled gallons of ink in writing the rulebook and gaming cards. If you draw Bright, you will have a +15 in graphic design and a +3 in local lore. Bright has poured his talents and energy into the game’s beautifully crafted art. When you draw Carlson, you will get a +6 for vision, a +5 for writing, and a +7 for marketing. Carlson was the wizard who brought that extra bit of impetus to the group, managing the marketing, writing, and videography for the game. “(We wanted to) utilize advancements in tabletop technology to create board games that play like role-playing games, but have the tactile beauty and storytelling qualities of your favorite graphic novel,” Scanlan said. The game utilizes deck-building to level up your hero while the tower rotates and different foes are presented to fight. When the game begins, each player chooses a hero. There are three classes, and each class has three characters, providing nine different possibilities. Each character has its own battle mat, which is vividly illustrated. The ultimate goal is to build your characters’ skills and strengths, while beefing up your inventory by exploring the tower and defeating foes. However, as you move through the tower, your sanity is slowly but surely drained. If you lose your sanity, the collective sanity of the group drops. If it drops below a certain level, you and your crew of adventurers become trapped for eternity in the tower of madness, or Ravingspire. In order to overcome the Ravingspire, you must find the Tower Key, align the secret passages and enter the Spire. Once inside you will face one of five unknown endings. Being that the game exploded through its initial goal and all its stretch goals, the crew of Vorpal Chainsword games has promised expansion decks for the future. Learn more about the game at www.vorpalchainsword.com/ravingspire.html.